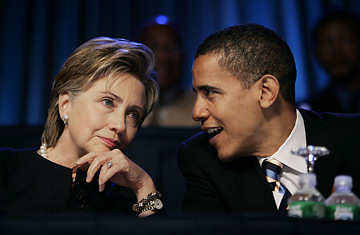 Sen. Hillary Rodham Clinton, D-N.Y., speaks with Sen. Barack Obama, D-Ill., during the annual convention of the National Association for the Advancement of Colored People in Washington, July 19, 2006. On Saturday, Barack Obama decided it was time. After months of refusing to directly attack Hillary Clinton  and months of running second to her in national polls  the Senator came out jabbing, and talking about how he planned to jab some more. "I don't think people know what her agenda exactly is," Obama told the New York Times in a story posted Saturday on the paper's website. "It is absolutely true that we have to make these distinctions clearer. And I will not shy away from doing that." Obama added that his plan had always been to go on the offensive in the fall, and that he would be targeting Clinton specifically on Social Security, Iran and Iraq in the days and weeks to come. Later, at an Iowa senior center, Obama made good on that promise. Alluding to Clinton's "Ready to Lead" slogan, he told an audience of about 75 people, "On issues as fundamental as how to protect Social Security, a candidate for President owes it to the American people to tell us where they stand. Because you're not ready to lead if you can't tell us where you're going." The Clinton campaign's response was immediate: "Senator Obama once promised Americans a politics of hope," said Howard Wolfson, a Clinton spokesman. "But now that his campaign has stalled he is abandoning that strategy and is engaging in the same old-style personal attacks that he once rejected. We are confident that voters will reject this strategy, especially from a candidate who told us he would do better." By contemporary standards, neither Obama's jabs nor Clinton's response are particularly venomous. But as Clinton continues to dominate in the polls, and the Iowa caucuses creep up on the calendar (earlier in the week the Democrats announced they'll caucus January 3rd) plenty of people believe that the only way for Obama to dent Clinton's lead is to take her on directly. "It won't be easy to upend her, but it is possible with the right kind of attack," says Larry Sabato, director of the University of Virginia's Center for Politics. "Obama and others need to point out that her polarizing nature may not only jeopardize the Democrats' chances for victory in 2008, but beyond." John Edwards, running third nationally, has been on the attack for months, criticizing Clinton for everything from her vote urging the Bush Administration to label the Iranian Revolutionary Guard Corps a terrorist organization to her repeated refusal to detail how she would fix Social Security. In August, Edwards even publicly asked Obama to join him in calling for Clinton to refuse donations from registered lobbyists, an invitation Obama declined. But campaign comity among the Democrats may be disappearing for good. At the same Obama event on Saturday, Obama was introduced by Tod Bowman, a schoolteacher who made headlines when he asked Clinton if she would consider raising the ceiling for Social Security taxes. (Currently only income up to $97,500 is taxed.) Clinton refused to answer the question publicly, but later approached Bowman and privately told him she'd consider an increase on those who make more than $200,000 a year. Her latter remarks were overhead by an Associated Press reporter. Later in the event Obama was asked about his perceived foreign policy "weakness" for his willingness to meet with adversaries such as Hugo Chavez and Mahmoud Ahmadinejad. He wasted no time in steering things back to his electoral adversary. "This is an area where Senator Clinton and I have a disagreement," Obama said. "Strong countries talk to their adversaries and tell them where they stand; that's always been something that I stood for, I've been consistent on that." Not exactly gladiator politics, but at the very least, Obama has started reaching for his sword.